ProtoMasons is a multi-player life simulator and sci-fi sandbox game. Host and join online servers with your friends as ProtoMasons, and build miniature virtual worlds together using flying robots, industrial-themed mini-games, and a simulated marketplace. ProtoMasons is perfect for custom role play, or as a casual multi-player social space. The game also comes with the 'Studio Gift Creator' with Workshop integration, which lets you create, share, and download interactive furniture and decorations, to truly customize your miniature worlds. 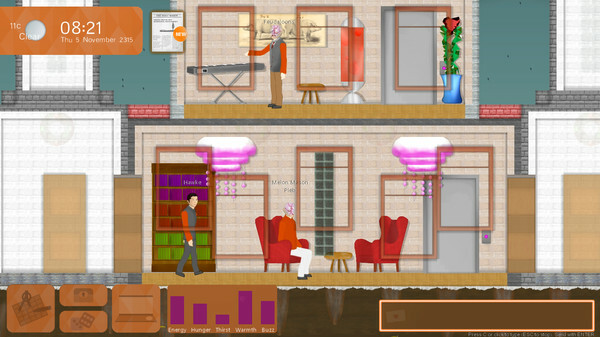 ProtoMasons made it through the Steam Greenlight programme in 2015, and was released as an Early Access product in 2017. ProtoMasons is now available as part of the Steam Early Access programme. The game is retailing for $14.99 USD. ProtoMasons is a multi-player life simulator and sci-fi sandbox game. You can host and join online servers with your friends, and build miniature virtual worlds together using flying robots, industrial-themed mini-games, and a simulated marketplace. The game was approved for release in 2015 after a successful Steam Greenlight campaign. It was released in early October 2017. Early Access is an opportunity to develop the game in a way that suits people who are interested in the product. "ProtoMasons has been built to be a unique multi-player experience, and going through Early Access is an opportunity to find out what players want to see in the game, and what could be improved and enhanced to make the experience more enjoyable. "It will be crucial to have a dialogue with the community. ProtoMasons will benefit from feature suggestions and constructive feedback on existing aspects of the game, so it can better suit fans of the sandbox genre, and evolve as a multi-player experience. I'd really like to take on board feature suggestions and try to develop the game to be a great experience for people who like casual online games." Update posted. Please see the Steam community hub for ProtoMasons for future updates. Thank you. Sorry, this project isn't really rushing to a deadline and I'm keeping it fairly private (apart from screenshots, demonstrations) for a while yet.